Keep score or post your game day menu with a chalkboard plaque. 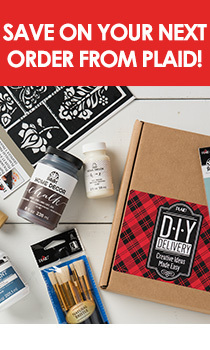 Plaid ® Stencils - Value Packs - Letter Stencils - Plain Jane, 2"
Base coat plaque Apple Red. Tape off field approximately 1 ½” from edges of plaque and paint Licorice. Leave tape and apply several coats of chalkboard paint allowing drying between coats. Remove tape. Stencil stars as shown and paint edge of plaque with Licorice. Tape of pennant pattern as shown and apply Steel Gray. Remove tape. Stencil letters onto pennants. Paint line to connect pennants with liner brush. Tip: Change paint palette to support team of choice.